Visual data analysis usually means charts. There are some limitations of using charts. In some cases, traditional charts don’t work well. Primary and secondary Y axis allows two different scales of data to be shown visually. But more than three scales are impossible to plot. Chart is a separate layer and needs to handled separately. Charts occupy lot of space because there are so many elements to be shown like gridlines, axes, labels and so on. If you try to reduce the chart size, the pattern gets flattened and difficult to interpret. Fortunately, there is a new way of data visualization available in Excel (since Version 2010) – Mini charts. Sparkline is a type of mini chart that is drawn in a single cell based upon data from multiple cells. Select one or more blank cells. Choose Insert Sparklines – Line. Select the input data. Click OK.
You can apply this to multiple rows or columns. Make sure you select the data correctly. 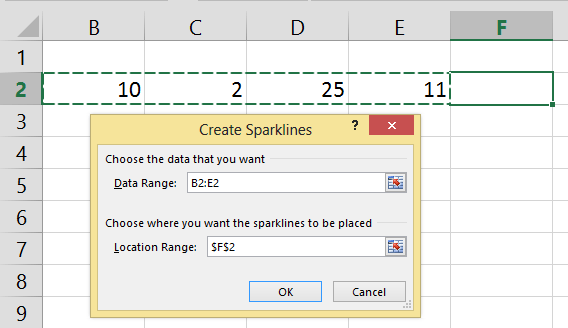 If you use this in a table, when more data is added to the table, new Sparkline will be automatically added. You can also increase the Sparkline by dragging it from the corner – just like formulas. When you Click inside the Sparkline, the Sparkline Tools tab appears. Make sure you go through EVERY option of this menu. You can then customize the visualization for your data quickly. This diagram uses Line for monthly fluctuation and Bar for country specific values. The last column is Win/Loss type of chart. It only depicts positive or negative outcome (Profit / Loss or Pass / Fail or Select / Reject). The line chart shows the fluctuation. In order to visually understand negative values, the Show Axis option puts a reference line at the zero position. In case of bar style, the minimum value is always shown as a thin line. Negative minimum values look better in bars. In the next article, we will explore some interesting practical scenarios for using Sparklines.